2015-16 Upper Deck Ultimate Collection Hockey. 5 Box Factory Sealed Hobby Case. 5 Premium Autograph or Memorabilia Cards Per Box! Connor McDavid and Jack Eichel Rookie Cards! Look for Signature Icon Fabrics! Configuration : 5 Boxes Per Case. 1 Pack of 5 Cards Per Box. Upping the hit totals again, 2015-16 Upper Deck Ultimate Collection Hockey sees an increase for the second straight year. Each box promises five total autographs or relic cards and all signatures are hard-signed. Increasing from two hits in 2013-14. And four hits in 14-15. Collectors will also likely be impressed by the on-card autographs that fill the release in addition to the fifth hit. 2015-16 Upper Deck Ultimate Collection Hockey starts off with a base set that only features relics and print run of 199 or 99. Along with that are multiple relic and autograph relic parallels and even more rarity. Also focusing on the top young players, including 30 key rookies like Connor McDavid, Debut Threads Jersey (#149) and Patch (#/5) are joined by Autographed Debut Threads Jersey (#/99) and Patch (#/10) cards. Additional options found in 2015-16 Upper Deck Ultimate Collection Hockey include Honoured Materials (#99 or less) , Iconic Fabrics (#/65 or less), and Material Achievements (#/99 or less) relics that also come as signed versions. Featuring Combos, Trios, Quads and Sixes, Ultimate Materials pair multiple relic swatches on the same card. Other notable memorabilia cards include Ultimate Jumbo Materials (#/40) with a 1.625 swatch. The Jumbo Materials also come as Signed Patch and Shield parallels. 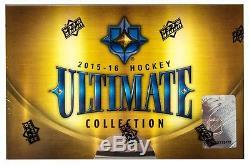 UPDATE: It has been announced that 2015-16 Upper Deck Ultimate Collection Hockey will be included in the e-Pack program. With an estimated release happening sometime after the physical release. Release Date: 8/31/2016 Product Configuration: 5 cards per pack, 1 pack per box, 10 boxes per case (5 per inner case). 2015-16 Upper Deck Ultimate Collection Hockey Box Break. 4 Total Hits (Autograph or Memorabilia Cards). 1 Rookie Autograph or Rookie Autograph Memorabilia Card. Every Box contains Five Premium Autograph or Memorabilia Cards! Get 1 Rookie Autograph or Rookie Autograph Material Card Per Box! All autograph cards are hard-signed! Ultimate Collection Autographed Rookie Shields feature this year's top rookies! These cards are some of the most sought after rookie cards of the year! Collectors will go crazy for the 2005-06 Retro Rookie cards! Featuring Autographs, Autographed Jersey, Autographed Patch and Autographed Shield Variations! Debut Threads are now limited to the top 30 prospects, each with Jersey, Autograph Jersey, Patch and Autograph Patch variations! Ultimate Jumbo Materials, each card sports a massive 1.625 x 1.625' swatch, including Signed Patch and Shield variations! Grab High-End memorabilia inserts like; Iconic Fabrics, Material Achievements, Honoured Materials and Ultimate Materials featuring combos, trios, quads and sixes! Look for Ultimate Dozen and Ultimate Rookie Autographed Booklet cards! Connor McDavid, Jack Eichel, Dylan Larkin, Max Domi, Artemi Panarin, Connor Hellebuyck, Sam Bennett, Nikolaj Ehlers, Noah Hanifin, Matt Murray. Rookie Autograph & Memorabilia Cards. Autographed Ultimate Rookies Tier 1 - #'d to 299 - Autographed Ultimate Rookies Tier 2 - #'d to 99 - Ultimate Rookies Tier 2 - #'d to 99 - 2005-06 Retro Rookies Autograph Tier 1 - #'d to 249 - 2005-06 Retro Rookies Autograph Tier 2 - #'d to 149 - 2005-06 Retro Rookies Tier 2 - #'d to 149 - Ultimate Rookies Jersey - #'d to 149 - 2005-06 Retro Rookies Jersey - #'d to 125 - Ultimate Rookies Autographed Jersey Tier 1 - #'d to 125 - Ultimate Rookies Autographed Jersey Tier 2 - #'d to 49 - Ultimate Rookies Jersey Tier 2 - #'d to 49 - 2005-06 Retro Rookies Autographed Jersey - #'d to 99 - 2005-06 Retro Rookies Jersey - #'d to 99 - Ultimate Rookies Patch //- #'d to 25 - 2005-06 Retro Rookies Patch //- #'d to 10 - Ultimate Rookies Autographed Patch //- #'d to 10 - Ultimate Rookies Patch //- #'d to 10 - 2005-06 Retro Rookies Autographed Patch //- #'d to 15 - 2005-06 Retro Rookies Patch //- #'d to 15 - Ultimate Rookies Tag //- #'d to 5 - 2005-06 Retro Rookies Tag //- #'d to 5 - Ultimate Rookies Autographed Shields // - #'d 1-of-1 - Ultimate Rookies Shields //- #'d 1-of-1 - 2005-06 Retro Rookies Autographed Shields //- #'d 1-of-1 - 2005-06 Retro Rookies Shields //- #'d 1-of-1 - Debut Threads Jersey - #'d to 149 - Autographed Debut Threads Jersey - #'d to 99 - Debut Threads Patch //- #'d to 5 - Autographed Debut Threads Patch //- #'d to 10 - Ultimate Jumbo Materials - #'d to 40 - Autographed Ultimate Jumbo Materials - #'d to 40 - Ultimate Jumbo Materials Silver Spectrum //- #'d to 3 - Autographed Jumbo Materials Silver Spectrum //- #'d to 6 - Autographed Ultimate Jumbo Materials Blue Spectrum //- #'d 1-of-1 - Ultimate Rookie Autograph Booklet Tier 1 - #'d to 99 - Ultimate Rookie Autograph Booklet Tier 2 - #'d to 49. Hard Signed Autograph, Memorabilia or Autograph Memorabilia Cards. Ultimate Signatures - Inserted 1:6 - Ultimate Signatures SP - Inserted 1:50 - Ultimate Dual Signatures - #'d to 15 - Signature Laureates - #'d to 15 - Signature Material Laureates Tier 1 - #'d to 40 - Signature Material Laureates Tier 2 - #'d to 15 - Signature Material Phenom's - #'d to 10 - Ultimate Jumbo Materials - #'d to 40 - Autographed Ultimate Jumbo Materials - #'d to 40 - Ultimate Jumbo Materials SP - #'d to 15 - Autographed Ultimate Jumbo Materials SP - #'d to 15 - Ultimate Jumbo Materials Silver Spectrum //- Varied #ing - Autographed Ultimate Jumbo Materials Silver Spectrum //- Varied #ing - Ultimate Jumbo Materials Blue Spectrum //- #'d 1-of-1 - Autographed Ultimate Jumbo Materials Blue Spectrum //- #'d 1-of-1 - Ultimate Material Combo - Inserted 1:10 - Material Combos Silver Spectrum - #'d to 15 or less - Material Combos Teal Spectrum - #'d to 15 or less - Ultimate Material Trios - Inserted 1:20 - Material Trios Silver Spectrum - #'d to 15 or less - Material Trios Teal Spectrum - #'d to 15 or less - Ultimate Material Quads - Inserted 1:30 - Material Quads Silver Spectrum - #'d to 15 or less - Material Quads Teal Spectrum - #'d to 15 or less - Ultimate Material Sixes - Inserted 1:50 - Material Sixes Silver Spectrum - #'d to 15 or less - Material Sixes Teal Spectrum - #'d to 15 or less - Ultimate Skills - Inserted 1:25 - Material Skills Gold Spectrum - Varied #ign - Material Skills Blue Spectrum - #'d 1-of-1 - Iconic Fabrics - #'d to 65 - Signature Iconic Fabrics - Varied #ing - Material Achievements - #'d to 99 - Signature Material Achievements - Varied #ing - Honoured Materials - #'d to 99 - Honoured Materials SP - #'d to 35 - Signature Honoured Materials Tier 1 - #'d to 85 - Signature Honoured Materials Tier 2 - #'d to 35 - Signature Honoured Materials Tier 3 - #'d to 15 - Iconic Fabrics Gold - Varied #ing - Signature Iconic Fabrics Gold - Varied #ing - Material Achievements Gold - Varied #ing - Signature Material Achievements Gold - Varied #ing - Honoured Materials Gold - Varied #ing - Signature Honoured Materials Gold - Varied #ing - Iconic Fabrics Gold Spectrum Tag - #'d to 3 - Signature Iconic Fabrics Gold Spectrum Tag - #'d to 3 - Material Achievements Gold Spectrum Tag - #'d to 3 - Signature Material Achievements Gold Spectrum Tag - #'d to 3 - Honoured Materials Gold Spectrum Tag - #'d to 3 - Signature Honoured Materials Gold Spectrum Tag - #'d to 3 - Ultimate Dozen Booklets - Tier 1 - #'d to 40 - Ultimate Dozen Booklets - Tier 2 - #'d to 20 - Ultimate Rookie Auto Booklets Tier 1 - #'d to 99 - Ultimate Rookie Auto Booklet Tier 2 - #'d to 49. The item "2015-16 Upper Deck Ultimate Collection Hockey 5 Box Factory Sealed Hobby Case" is in sale since Thursday, January 25, 2018. This item is in the category "Sports Mem, Cards & Fan Shop\Sports Trading Cards\Ice Hockey Cards". 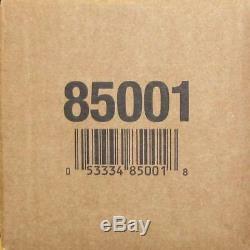 The seller is "sportscardsetcpgh" and is located in McKees Rocks, Pennsylvania.